China is ready to discuss Turkey's membership of the Shanghai Cooperation Organization (SCO), the Chinese ambassador to Turkey said Friday. 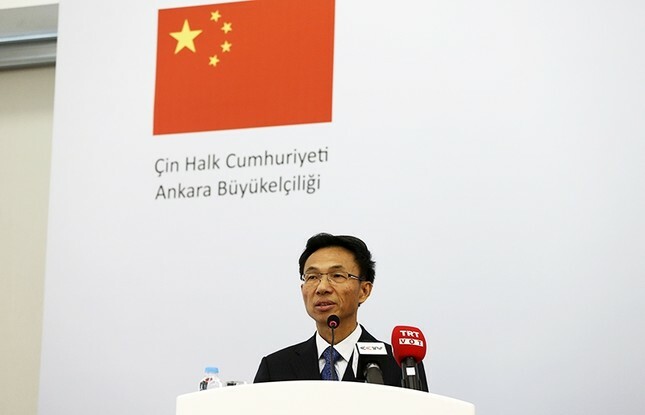 Yu Hongyang told Anadolu Agency that Beijing would be willing to discuss Turkey joining the six-nation bloc with other member states. Speaking ahead of President Recep Tayyip Erdoğan's visit to China, Yu said: "Turkey has reached the position of being a dialogue partner of the organization by attending the activities of the SCO in recent years. "China, which understands Turkey's intention of becoming a member of the SCO, is ready for Turkey's membership… in consultation with other member countries." The SCO is made up of Russia, China, Kazakhstan, Kyrgyzstan, Tajikistan and Uzbekistan. Turkey was approved as one of six "dialogue partners" in 2012. There are also six "observer states" linked to the organization, which was established in 2003 with the aim of promoting cooperation between members and maintain regional stability. On Friday, Erdoğan will leave for China for an economic summit. It will be his fourth meeting with Chinese President Xi Jinping in the past two years. Yu said China hoped to narrow the trade gap between the two countries and improve visa regulations for their nationals. He noted that China had emerged as Turkey's second largest trading partner -- exporting $24.44 billion worth of goods and services to Turkey last year, accounting for 12.8 percent of Turkish imports. In the same year, Turkish exports to China amounted to $2.32 billion, or 1.6 percent of Chinese imports -- an imbalance Yu said it was important to redress. Trade between the countries has grown steadily over the last 10 years, from $14.26 billion in 2007. According to the Turkish Statistical Institute, Chinese imports constituted 9.7 percent of Turkey's total imports over the decade, worth $2.1 trillion. Over the same period, Turkish exports to China were worth $1.3 trillion, or 1.7 percent of Turkey's exports. "There should be efforts for forming a fair, friendly and practical investment climate to speed up dual investment," Yu said. "Now there is a significant trade surplus in the trade between China and Turkey. "China is not seeking trade surplus in trade activities. By making efforts with Turkey, our country will speed up the development of bilateral economic relations and trade in a stable, healthy and continuous way." He listed Chinese efforts to reduce the trade gap, such as sending buyers to Turkey and inviting Turkish businesses to China. "Root causes, such as economic structure, are causing a significant trade gap between the two countries," Yu added. By encouraging investment and tourism in Turkey, China hoped to reduce the disparity. In a separate interview with Anadolu Agency, the chairman of the Turkish Exporters' Union, Mehmet Büyükekşi, said trade between the countries was gradually improving. "Turkey's export to China advanced by around two-and-a-half fold to $2.3 billion in the last decade," he said. "China's share in Turkey's total exports rose by 0.7 points to 1.63 percent in this period." This rise had seen China move from Turkey's 23rd largest export market to its 19th. "Trade relations between Turkey and China are growing and developing day-by-day," he added. Exporting higher value products to China would help resolve the trade difference. "We aim to know this market better by visiting China with our exporters in the forthcoming period," he said.